Tenure: What is it Good For? Our readers seem divided, or at least concerned, over this academic institution's future. Can YouTube Save the Planet? Pooling videos can provide instant evidence of global environmental problems. The system of scientific authorship is in crisis. Two new rules could help make things right. A once-obscure virus spreads its wings, sickening hundreds. How did this happen? Does tenure need to change? 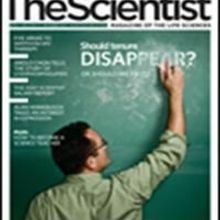 What will tenure look like in 2012? What some of our readers did, or have to do (if still on tenure-track), to earn tenure. Alan Hinnebusch has worked doggedly through the years to figure out how yeast genes are regulated. New details about structure and size of prion proteins reveal insights into infectivity. Some executives would have left a company after being demoted. Graham Allaway didn't do that at the HIV therapeutics company Panacos, and it's better because of it. So you want to be a science teacher? Here's how to get started.